6 September - The approach of Autumn has taken a step forward today. We had our evening meal inside for the first time since returning from our holiday. These past few weeks have have been mild and we have seen hardly any rain. Today has been little different although it has been quite windy, hence the move indoors. There are a few signs in the garden of the changing season. 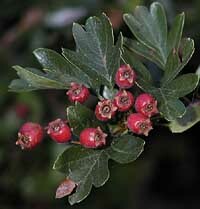 The berries on the Hawthorn are now bright red, although there are fewer than promised by the blossoms earlier in the year. Perhaps this reflects the lower level of honey bee activity that I have seen this year. 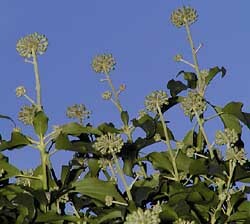 The Ivy tree is the other main indicator - it is now covered in flower buds and it will not be long before it becomes the centre of attraction for a variety of insects, hopefully including late butterflies. Bird activity in the garden continues to be dominated by the sparrow flock and they have been the attention of the Sparrow Hawk this week. I have seen four 'visits', including one when the hawk emerged from the Hawthorn tree and flew right past me, sparrow (still calling) in its clutches. 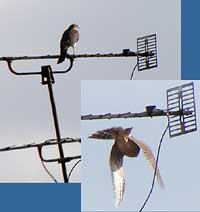 The picture shows a different visit when the hawk waited on the TV antenna. When it had been still for a few minutes some sparrows relaxed their guard and one was ambushed as it flew between the houses, although I think it escaped. 7 September - It rained last night. Last month I commented on the number of ladybird larvae that were on the Birch tree. By the end of the month most of them had pupated and on the 28th I pictured one that had just started this process alongside a fully formed pupa. This evening I checked the same leaf and saw that the right-hand pupa has in fact given up its occupant. 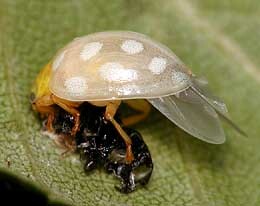 A check around the tree revealed more empty pupal cases, and this newly emerged adult ladybird. I have recorded this species twice before as adults in the garden. Back in 2001 I spotted one on the Birch tree on 7 July, and this year on 10 May on the Elder, right next to the Birch. I was not certain of a correct ID although the nearest match in my guides is Calvia 14-guttata, although this seems to have too many spots. I took another look at the tree at 9pm and found several more newly emerged adults - here are two of them. The left-hand one must have only emerged a short while ago, judging by its colour. 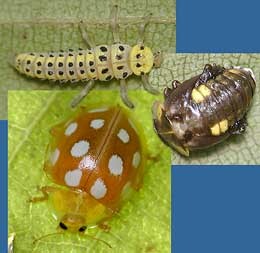 It would seem that they are all of the same species, so it is interesting to compare their spots. Despite what I said at the beginning of today's entry, I also saw 12 more of their larvae (including three very small individuals) on the undersides of the birch leaves. I could not see any on the Elder. The Sparrowhawk paid an early breakfast visit this morning when it attacked the Hawthorn just after 7.30am. There were only a couple of sparrows about and I don't think it caught any. This evening I saw a juvenile robin down on the ground under the Hawthorn - robin visits are not the regular thing we were used to earlier in the year. 8 September - An update on yesterday's ladybirds. 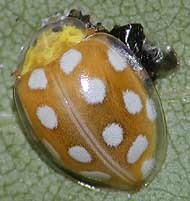 The species is Halyzia sedecimguttata - the Orange Ladybird. 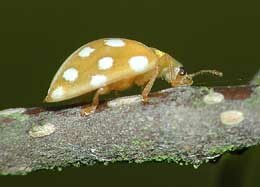 Not mentioned in either of my Chinery insect guides, it is an unusual ladybird in that it eats mildew, being one of four vegetarian ladybirds in the UK (out of 42 UK species). First thing this morning those newly emerged adults were still by the pupal cases, but the first one (pictured here) was soon moving as the morning sunshine warmed up the leaves. 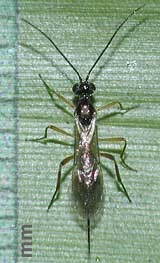 It measured about 7mm long and was still partly transluscent. The larva shown here, about 8-9mm long, was presumably 'grazing' as I took this picture. Its head was moving from side to side as it moved forward very slowly. When they want to move elsewhere, the larvae can move quite quickly along the branches. 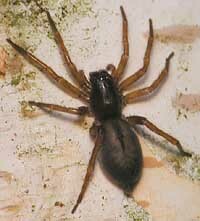 I timed one as it scurried along at over 1cm/sec. When it got to a leaf stalk it would go along it as far as the start of the leaf blade and seemed to test it. Usually it would go back down the stalk and carry on to the next one, doing this several times before deciding to stay on a leaf to graze. 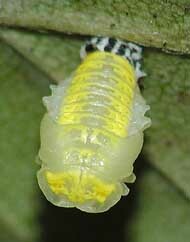 The pupae are just under 5mm long. I had hoped to watch an adult emerging today but at 9pm there was no sign of that happening. What I did see however, was one of the pupae moving, showing that it was attached to the leaf by the rear end only (top right in today's image). 9 September - I had hoped for another chance to see one of the ladybirds emerge today but I have been thwarted by the weather. I have seen more rain today than over the last few month. Having checked the pupae first thing this morning, I dashed out after a downpour only to find this ladybird had emerged during the rain. A short while later its wings had been retracted. I should emphasise that all the Orange Ladybird pictures I have included in the diary are of individuals on the undersides of the birch leaves. The rest of the day has seen almost continuous rain so there was no question of taking the camera out again, and tonight I could not see any other 'new' ladybirds. The forecast is better for tomorrow. 11 September - A day of rememberance of those terrible events of last year - thank goodness today seems to be passing peacefully. In the garden my attention is still drawn towards the birch tree and the Orange Ladybirds. 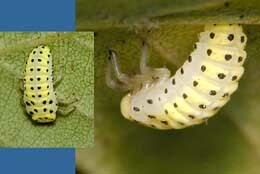 Here, a larva is pictured as it moulted. Between moults the larva is known as an instar. Unfortunately I had to go out after taking the left hand image. 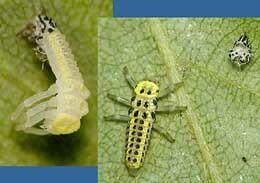 The right hand picture was taken of the larva about 3 hours later - it is about 6mm long. 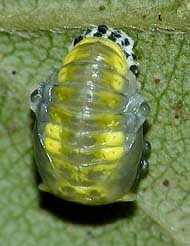 A couple of leaves away, another larva has entered the pre-pupal stage today and measures about 6mm long at this time. It has been hanging from a leaf nearly all day with no obvious changes seen so far. 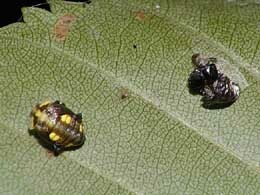 On yet another leaf on the same branch is a pupa. I have a tripod set up so that I can place my camera quickly if I spot the adult emerging. At night there is a lot of activity, including spiders like this on climbing up the trunk of the Birch (pictured last night). My first attempt at identification suggests that it is a Scotophaeus blackwalli. Using a torch often reveals Harvestmen amongst the branches, but this picture was taken during the day. 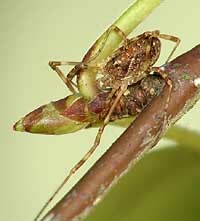 This individual had tucked itself under the base of a leaf stalk. It remained in thei position all day, leaving only after dusk. Notice the bud on the Birch. 12 September - Between doing a bit of pruning and weeding on a very pleasant warm and sunny day I made frequent visits to the birch tree to check on the Orange Ladybirds. The prepupa and pupa mentioned yesterday seem unchanged today, while the adults and larvae continue to roam the branches and leaves. While I sat on our deck to have some lunch the Sparrows decided to arrive in force at the feeders. 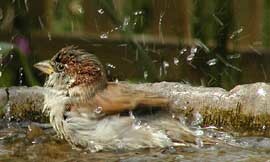 Here, a male has taken a break from feeding to bathe. 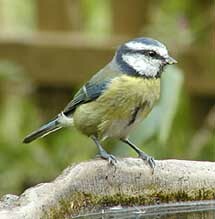 At a quieter moment this Bluetit also came for a bath. This one has taken to visiting the area under the hawthorn where I throw down chopped peanuts for the Dunnocks - I have still to get some good pictures of them. An adult Robin is also becoming a regular to the same spot. A tiny fly on a bamboo leaf seems to be an Ichneumon fly, between 4-5mm long. These flies search for the larvae of other insects in which they will lay a single egg. 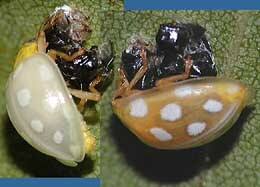 This will hatch into a parasitic larva that feeds on its host. 13 September - On another beautiful, warm day an Orange Ladybird update - In the 11th Sept entry there is a picture of a larva entering its pre-pupal stage. This morning it has undergone a moult and has now taken up the shape of the pupa. 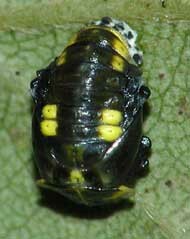 The picture was taken as the pupa flexed so that the head end hung down away from the leaf. An hour later (2.30pm BST) it is getting noticably darker. This time the pupa is curled against the leaf. Here it is at 4.30pm. In the meantime, the pupa I have been watching the last couple of days still hasn't 'delivered' an adult - it should not be much longer! In the same part of the tree I can see two more larvae that are now at least 1cm long and which are likely to pupate soon. 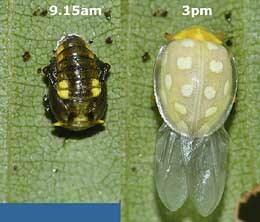 As usual, a quick check of the birch leaves reveals insects roosting while spiders, and other insects are very active. 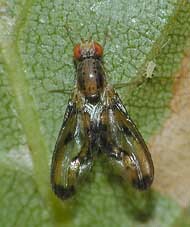 This small fly has a body about 5mm in length and, although I cannot identify it I think it is probably a member of the family Tephritidae - the picture winged flies. 15 September - The weather continues dry as high pressure hangs on to the north. It has been bringing cloud and cooler North-Easterly winds, so we are feeling the start of Autumn. 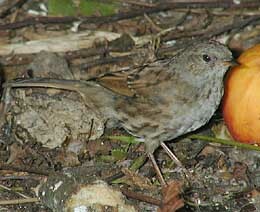 The picture shows one of the young Dunnocks that frequent the ground under the hawthorn. I have been trying to get a shot of a Dunnock for ages, but only recently bought a lead to allow me to use an 'off-camera' flashgun. This means that at last I can penetrate the shadows of the border, where the Dunnock is happiest. The first (still green) leaves are falling from the Birch tree in the wind. 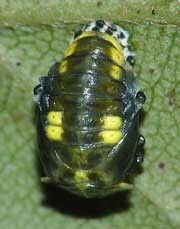 I hope that the Orange Ladybird larvae complete their development before 'their' leaves are shed. I see that another larva has entered the pre-pupal stage this morning. Even though the larvae seem to wander widely on the tree they seem to choose just a couple of areas in which to make the change to pupae. Entry continued in the afternoon - Sod's Law has been in action again! I needed to go out for a while this morning and in my absence the pupa I had been watching for most of last week had given up its contents, another adult ladybird and I missed it again. I had taken a picture of the pupa earlier this morning and there was no sign of action then. Two more larvae have now moved into the same few branches so I should have a few more chances over the next week.